Living in a Tamale World cuz I am a Tamale Girl: Tina Tamale is BALLE Bound! Tina Tamale is BALLE Bound! It's that time of year, the rare time that I leave my beloved Old Oakland to learn more about Being Local! Yes, apparently I need to go somewhere else to do that! I am very fortunate to be attending this year's Business Alliance of Local Living Economies (BALLE) Annual conference. Last year, many of you remember that I went to Boston, this time it's closer in Denver, Colorado. I know it will be an action packed week of knowledge and networking with other community minded, sustainable folks. All business is having it's issues with our economy being what it is this year. Indie business is doing what needs to be done by banding together and seeing what is possible now and in the future. My friends and colleagues are still riding the high of this year's Oakland Indie Awards. We're taking that energy and spirit with us tomorrow to share. I'll still be posting on Facebook over the rest of the week. Join me there to follow along. Stop by and visit the lovely crew of mujeres at La B while I'm gone now through Saturday. 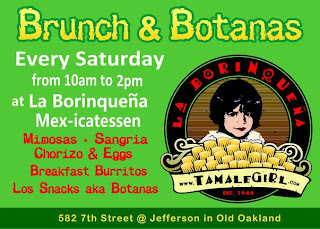 Don't forget Brunch & Botanas is every Saturday from 10am to 2pm. Oh, we will be closed on Monday for the holiday and return on Tuesday.